The UIPM Court of Arbitration has reviewed the decision taken by the UIPM Doping Review Panel in the case of Qian Chen (China) after the athlete registered a complaint through her national anti-doping body (CHINADA). Qian Chen was originally suspended for four years by the UIPM Doping Review Panel following her disqualification from the Rio 2016 Olympic Games, where she had finished 4th in the Women’s Individual event. The athlete was found to have committed a doping violation during the Rio Games after testing positive for the banned substance Hydrochlorothiazide (HCTZ), a diuretics or masking agent. The suspension imposed on Qian Chen (China) has now been reduced from four years to two years after detailed analysis of the situation. Qian Chen will be permitted to compete from the end of her period of ineligibility on August 21, 2018. UIPM is fully committed to the fight against doping, the promotion of clean sport and protection of clean athletes. MONACO, May 16th 2018 - The UIPM Doping Review Panel has imposed a 15-month suspension on the athlete Logan Storie (United States) following a doping violation. The athlete tested positive for the prohibited substances Androsterone and Etiocholanone after a urine test carried out during UIPM Pentathlon World Cup Los Angeles on February 24, 2017. The offence contravened Article 2.1 of the UIPM Anti-Doping Rules, which carries a standard suspension of four years, “unless the athlete can establish that the violation was not intentional”. In this case, Logan Storie (USA) provided evidence that satisfied the UIPM Doping Review Panel that he did not knowingly ingest the prohibited substances, and his suspension was set at 15 months. All of his results in UIPM competitions since February 24, 2017 have been disqualified and he is free to return to the sport from May 24, 2018. UIPM is fully committed to the fight against doping and the promotion of clean sport and clean athletes. The fight against doping is fundamental to the integrity of Modern Pentathlon and all UIPM Sports. Through its National Federations, UIPM operates a zero-tolerance policy on doping and cheating in any form in order to protect clean athletes and promote clean sport. 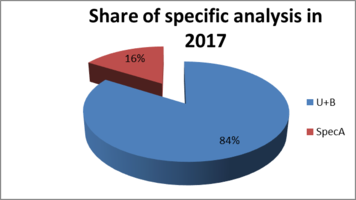 In 2017 the UIPM testing programme continued to evolve, using the latest systems for intelligence and analysis. In accordance with the directives of WADA, the UIPM Anti-Doping Programme is focusing on unannounced out-of-competition testing and this activity involves collecting athlete biological passport (ABP) tests. In 2017 UIPM’s international registered testing pool consisted of 27 athletes across the entire UIPM world. From 2018 UIPM has introduced a wider testing pool in order to raise the effectivity of its testing programme. In 2018 the number of in-competition tests will remain relatively constant. Out-of-competition testing will, however, focus on effective testing using intelligence. The testing approach changes from season to season, in view of intelligence and to ensure there is no familiarization with testing routines. Emphasis is also placed on carrying out testing where the national anti-doping program is not able to do so at a high level. The above numbers do not include the out-of-competition tests conducted by the National Anti-Doping Organizations (NADOs), which also come under their responsibility. UIPM, in cooperation with local organizing committees, conducts in-competition testing at all UIPM World Cup events. Additionally, testing is coordinated with many NADOs and private providers who carry out in-competition testing at UIPM World Cup events. The World Anti-Doping Agency (WADA) has published its 2018 List of Prohibited Substances and Methods, an important resource for anyone involved in the UIPM Sports and the wider international sporting movement. The list, which comes into force on January 1, 2018, is accompanied by the 2018 Summary of Major Modifications and Explanatory Notes, which serves to help athletes, coaches and other support personnel to understand the latest changes. “WADA is pleased to publish the 2018 Prohibited List,” said WADA President, Sir Craig Reedie. “Updated annually, the List is released three months ahead of taking effect so that all stakeholders - in particular athletes and their entourage - have sufficient time to familiarize themselves with the document and its modifications. MONACO, June 27th, 2017 – The UIPM Anti-Doping Panel has confirmed that modern pentathlete Maksim Kustov of Russia will serve a four-year suspension from UIPM Sports as a result of a doping offence relating to the athlete’s biological passport. This follows the provision of evidence to UIPM by the Russian Anti-Doping Agency (RUSADA), which recently announced a four-year suspension for Maksim Kustov as a result of its findings. UIPM recognizes and supports this action by RUSADA and Mr Kustov will be ineligible to compete for a period of four years starting on October 4, 2016. The sanction includes the disqualification of results achieved by Mr Kustov during the period June 15, 2015 to October 4, 2016. MONACO, March 1st, 2017 - The International Olympic Committee (IOC) wrote to the Union Internationale de Pentathlon Moderne (UIPM) on February 27, 2017 to communicate a Disciplinary Commission decision regarding the athlete Viktoriya Tereshchuk (UKR), winner of a bronze medal in the Women's Modern Pentathlon at the XXIX Olympiad in Beijing in 2008. Viktoriya Tereshchuk has been disqualified from the XXIX Olympiad in Beijing in 2008 and instructed to return her bronze medal, diploma and medallist pin. The Disciplinary Commission found that Viktoriya Tereshchuk had committed an anti-doping rule violation after it was established that she had tested positive for the presence and/or use of a Prohibited Substance in a bodily sample provided on August 22, 2008. The substance in question was dehydrochlormethyltestosterone (turinabol), an exogenous anabolic steroid. Viktoriya Tereshchuk has been informed of the decision via the Ukraine National Olympic Committee. She has 21 days in which to appeal to the Court of Arbitration. The UIPM Doping Review Panel has had full regard to all the matters before it and it has confirmed for the Athlete the period of ineligibility of 2 years. This penalty is to run from 29 July 2016 (the effective date when the Athlete’s provisional suspension started) until and including 28 July 2018. This article is intended to provide an update on UIPM Anti-Doping Activities leading up to 2017 season. The fight against doping is fundamental to the integrity of sport for UIPM and its member National Federations, through a zero tolerance policy on doping and cheating in any form, in order to protect clean athletes. The UIPM testing program has continued to evolve using the latest systems for intelligence and analysis and we are very confident that anyone who dares to try will be caught. In accordance with the directives of WADA, the UIPM Anti-Doping Program starts focusing on unannounced out-of-competition testing and this activity involves collecting athlete biological passport (ABP) tests. The International Testing Pool of UIPM currently consisted of 30 athletes across the entire UIPM world. 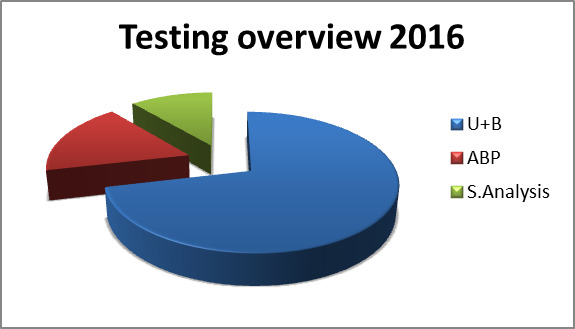 For 2017 the number of tests will remain relatively constant, however the focus is on effective testing using intelligence. The testing approach changes from season to season, in view of intelligence and to ensure there is no familiarization with testing routines. Additionally emphasis is also on carrying out testing where the national anti-doping program is not able to do so at a high level. The above numbers do not include the out-of-competition tests conducted by the National Anti-Doping Organizations (NADOs) which also come under their responsibility. At World Cups UIPM conducts in-competition testing at all UIPM World Cup events. Additionally, testing is coordinated with many National Anti-Doping Organizations (NADOs) and private providers who carry out in-competition testing at UIPM World Cup events. The IOC has established and adopted these () in accordance with the Code, expecting that it will contribute to the fight against doping in the Olympic Movement. Result management of anti-doping rules violation will be lead under (). IOC has decided to abrogate the current edition of the Olympic Movement Medical Code (OMMC) (- i.e. in force as from 1 October 2009) and replace it with a new version (- i.e. in force as from 31 March 2016). UIPM agreed compliance to the new Olympic Movement Medical Code which came into force 31 March 2016. The code can be found .